The flagship of the four new mid-range phones ticks the right boxes. The LG Magna is a mid-range phone that skimps a little on the high end materials in a bid to lower the cost. 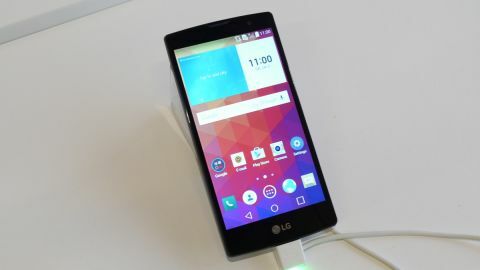 It was launched alongside three other mid-range LG phones called the Spirit, Leon and Joy in February 2015 but we've managed to get some hands on time at MWC 2015. LG's Magna is sat at the top end of the new range but is still well and truly designed to be a mid-range handset. But that isn't to put the LG Magna down, if the Magna is priced competitively it may end up as a capable mid-range option. The LG Magna comes with a 720p screen, equalling 294ppi, which is a bit of a shame as I would have loved to see Full HD here. It does mean it LG can price it a little cheaper though and more importantly it should save on battery as the handset will have less pixels to push. There's a 2540mAh battery inside setting it up well to do some long stints, but sadly we haven't had the time to properly test out the set up just yet. The smartphone also makes use of in-cell technology, which allows the screen to look sharper and feel more responsive. When first using the handset for this hands-on I barely noticed the display wasn't Full HD. I expect watching video or playing graphically intensive games will bring it to your attention more but the in-cell technology works wonders making for an all-round impressive viewing experience. In terms of design, the LG Magna is quite basic, but with a pleasant curve on the rear meaning it sits in the hand well. It doesn't come with a premium looking design but it has done the next best thing, the plastic back panel has a grated texture meaning the grip is better than on a metal uni-body as well as feeling unique on the hand. I really like the effect on the back panel and it just mixes it up to something a bit different rather than the dull effect of plastic we're used to at this end of the market. When I intitally picked up the handset I really noticed how light it is, making it feel a little flimsy and clumsy old me is likely to pull this out of a pocket and throw it across the room without even noticing. That may be a problem for some but at least it won't be weighing you down. The front of the phone is a basic square and leaves a little bit to be desired but all in all it is an attractively designed phone, especially when compared to some of its competition. The back is removable as well, allowing you to swap the battery out and access both the SIM and microSD ports. LG's unique back panel buttons are here as well with the volume rocker sitting either side of a power button on the front. The easiest way to open up the display is to use Knock Code and tap the screen but the button is also within easy reach on the back as well. Under the hood is a 1.2GHz quad-core processor with 1GB of RAM. As with the rest of this range there isn't much internal storage available, it's only got 8GB on board and once you take into account all the software it'll likely be under the 5GB mark for all your media. That's why LG has opted for a microSD port supporting cards up to 32GB. It's a shame LG hasn't gone down the 16GB route here, 8GB really isn't enough anymore and picking up a microSD card is just another expense for the user. The camera set up offers an 8MP sensor on the rear grasping an impressive image quality of 3264 x 2448 pixels as well as boasting autofocus and an LED flash. This should set you up well for taking any images with the back and selfies will come out picture perfect as well with a 5MP front facing sensor. Android 5.0 Lollipop is the name of the game with these new LG handsets and it offers a new experience to that of KitKat. The design changes of Lollipop look great with LG's UI layered over the top and it's great to see such recently released Android software on a mid-range handset. The LG Magna is the stand out handset of the new range and ticks nearly every box you want it to in the mid-range. The display may have been better with a few more pixels pushed in but it doesn't really need it and the design is one of the best from the mid-rangers available at the moment. LG has managed to push the Android 5.0 Lollipop software out nice and early too which is always appreciated while the camera set up seems strong, especially the front camera offering high-quality selfies with Gesture Mode and compatibility with a selfie stick built in. The biggest concern comes in the storage – 8GB isn't enough for any user in 2015 with files, apps, video and music taking up more room on the average handset. Fair enough, you can head out and pick up a microSD card but 32GB once again isn't that large and it's just an extra expense – this is one area LG shouldn't have skimped on. But the fact that's my biggest gripe with the handset suggests it is all round an impressive set up and if LG manages to give it the right price we could end up seeing a very popular mid-range handset in the Magna.